With festive feasts and New Year approaching, I am sure you like to add some detox drinks to your diet in order to cleanse your body and boost up the immune system. Trust us; making your own Detox Drink is pretty easy as you probably have most of the ingredients in your kitchen. In this post we have prepared a few drinks that can be served alongside with breakfast, teatime or main course which I hope it will be useful for you. Descendants Of The Sun (DOTS) fans, here is a good news! dal.komm COFFEE which featured in the drama has opened their first cafe here in Singapore at The Centerpoint on 03rd December 2016. This Korean style music concept cafe aims to bring music, coffee and dessert all under one roof. They also features the brand's iconic plushies; wolf & rabbit as seen in the show but currently there is only a pair available at the cafe for patrons to take photos with. Hi everyone, today I am sharing a long overdue post on making Onigirazu (おにぎらず) which I have posted months back over at Instagram and Dayre. This super easy to make rice balls is similar to sandwich concept using "stacking/layering" method with rice and assorted fillings such as meat, vegetables and or egg to make rice parcel. In the step-by-step recipes below I made both version of Pork and Chicken Katsu Onigirazu as well as some with egg mayonnaise, luncheon meat and etc. So be creative and create your very own onigirazu with your favourite ingredients. Hello everyone! Trick or Treats for this Halloween? Time flies as we have being missing from this space for more than 3 months due to personal commitments and health. Here I sincerely apologies to all friends and readers who still frequent this website to checkout our recipes and updates. Will definitely try my best to update as frequent as possible but meanwhile you can still catch up our on-going updates over at Instagram account. Since it's Halloween today, I would like to share a related themed post which I hope you will like it. Till then enjoy your party today with lot of fun and spooky food. Pompompurin Cafe (布丁狗餐厅) is the first Sanrio character cafe in Singapore follow by Hello Kitty Orchard Garden which is located at Changi International Airport (terminal 3, arrival hall). Pompompurin or aka Purin is a big yellow coloured dog who wears his trademark brown beret. This newly setup cafe is located at level four of Orchard Central Mall and the queue starts to form even way before it opens at 11am. Overall our impression of the cafe on our first visit was quite neutral. Despite of the waiting time (the queue and serving time for food), average food and price I think the cafe is still an insta-worthy place if you are looking for something different. Hello everyone! What are you busying with this weekend? Time flies while I was drafting this post about our first visit to the Geylang Serai Hari Raya Bazaar (also known as Ramadan Bazaar @ Geylang Serai) last weekend. This festive bazaar is definitely huge with around 800 stalls selling different range of things from fusion to local street food & beverages, clothing, carpets, accessories and more. Geylang Serai Hari Raya Bazaar is running daily from June until 06 July 2016 with most of the stalls opening from 5.00pm till late in the evening. The area is accessible by car with ample of parking lots available at the HDB carparks or within walking distance by public transport from Paya Lebar MRT station (walk towards Sims Avenue). Happen to chance upon this miniature DIY food kit while exploring a Japanese 100 yen (S$2 shop) known as Tokutokuya. This shop has many interesting household and food stuffs imported from Japan with most of the items pricing at S$2 unless otherwise stated. The miniature food kits which the boy spotted are from Kracie and they come in different designs like hamburgers, sushi, pancake, donuts and etc for your selection. The pizza kit (SG$5 per box) which we bought can make two 6cm size pizza, four cute face potato cake and a cup of grape soda. Although the end product might be too small to fill the tummy but the boy enjoys the making process as well as a fun experience of owning a pizza shop. "Eat with your hands and don't be shy" is the slogan for today's post. Although I am not a huge seafood fans but I always wanted to find an opportunity to try boiled seafood in bag which is quite popular get-together dish in Singapore where you can enjoy with a group of friends. With that in mind, I replicate this Cajun Seafood Parcel by seasoning the ingredients with Cajun spices, wrap and bake until cooked. We love the sauce underneath which was flavourful and pack with hint of sweet, spicy & buttery taste. Oh ya make sure you remember to toss the mixture with the sauce before serving to enhance the flavour. Recently due to the new Angry Birds movie it seems to bring back memories for those who love its related mobile game on those battles between the birds and green pigs. And with that fast food chain restaurants in Singapore are selling Red Angry Birds Burgers and Spicy Nuggets in conjunction of the movie too. As for me in order to surprise my boy who is one of the Angry Birds fans, I made him these cute Angry Birds Rice Burgers together with some related design fruit cutouts as a reward for his good performance in mid-year school exam. It has being a long time since my last food art on cartoon characters because the boy has passed that "cute food" stages where I used to make his food look appealing (bento ideas). When flash back I do missed those fun days where we both work together to make bentos and he will help to prepare the ingredients as well as assembling the dish. Yeah! Today is the first day of mid-year school holidays which I am sure some of you already have plans line-up for your kid(s) with activities, programmes or oversea trip. No matter what it is I hope you can have a wonderful bonding time with your loved ones. For this week post, I am sharing another chiffon cake recipe using "rice flour (粘米粉)" which we often used it in Asia recipe to make steamed cake with yam or radish. Basically rice flour give a better texture for chiffon cake which is lighter and the recipe also requires less sugar and oil. Hello everyone how's your weekend? Finally mid-year exam for the boy had ended last week and now I am back with my usual routines on trying out new recipes. Last week I baked the above chiffon cake using mixture of cake and rice flour together with blue pea flower water. Initially I thought the cake will turn out to be either light blue or purplish colour but it ends up pale green which resemble matcha cake. Guess next round I have to intense the colour by adding more dried blue pea flowers while making the "blue water". Hello everyone! How's your weekend? Today I would like to wish all mothers and mothers-to-be a Happy Mother's Day filled with loves, happiness and good health. With the opening of Pompompurin and Hello Kitty Cafe in Singapore, I wish there is also a Winnie The Pooh Cafe too. So to make my dream come true, the boy helps to prepare the above Pooh Pancake Breakfast as a Mother's Day treat to show his love for me. Mother's Day is just a few days away and to avoid the festive crowds I am sure many of you have already celebrated it ahead. But if you are still planning to bake something for mum this coming Sunday, perhaps you might like to take a look at 3 of our feature recipes below. To cater for different preference we have light and spongy Sakura Matcha Chiffon that filled with light floral scent. Or for a good after meal dessert go for 1-Pot Chocolate Cake which is rich and moist to serve with a scoop of vanilla ice-cream. Pasta is a hearty dish that suits the needs of both adults and children. 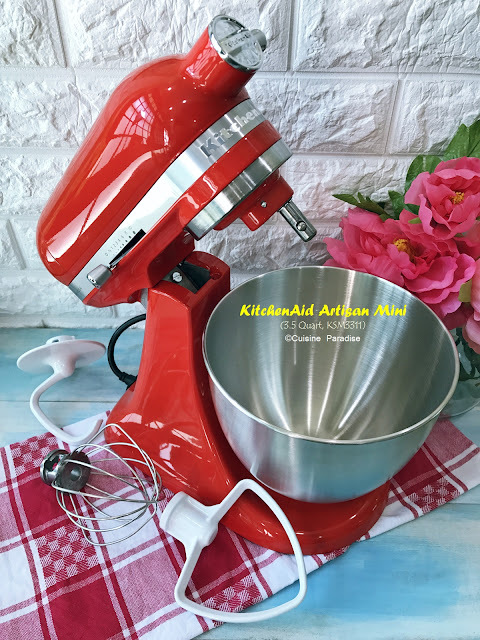 You can either use dry pasta noodles or make your own with the help of pasta machines or hand knead by adding simple ingredients like flour, water and eggs. When done it can be used to cook with different ingredients such as spinach, mushroom, seafood or beef together with sauce of our choice. Best of all, pasta makes a quick-and-easy weeknight meal for the family. Below are five of our family favourite pasta recipes which I often rotate around with the bake version. Hope these it will be a useful reference for your weeknight dinner. Sesame oil and ginger are two of my favourite ingredients used in my daily cooking. 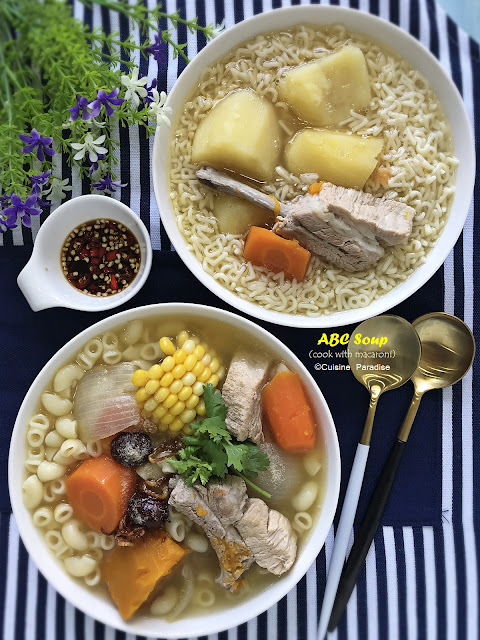 As a huge fan of Sesame Oil Chicken; a popular confinement dish, I am also in love with the soup version by adding mee suah (mian xian - 面线) into it. All the while this dish has become one of my comfort food whenever I need to warm up or drive out the wind in my body. There are a few ways in preparing Sesame Chicken Mee Suah depending on individual preference. Some might use full portion of rice wine instead of water (or mixture of water and rice wine) for the soup base. Below is a quick recipe for our version. Recently there is this "salted egg yolk" craze going on in Singapore where you can find restaurants and cafes coming up with innovative ideas such as croissant, ice-cream, chips, cake, cookie and etc using salted egg yolk as the key ingredient. Besides sweet treats there are also many popular dishes with crab, prawn and chicken cooked using salted egg yolk. Here we are featuring one of our favorite cze char version using chicken (chicken leg and mid-joints) which are deep-fried in flour batter then coated with buttery salted egg sauce. 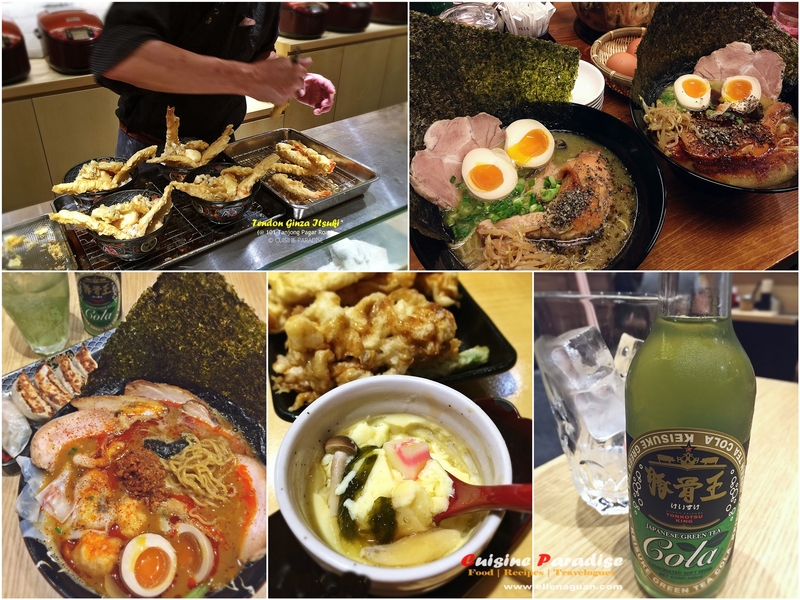 Over the years, the huge number of ramen shops sprouting up around Singapore has proved its charm to the local. This Japanese style noodle is not only delicious but also relatively affordable where it comes with thick and rich broth made using either pork bones, chicken or even lobsters. In this post we will be sharing our verdicts on two ramen and a tempura tendon outlets by Keisuke brand that we had visited recently. Being using my reliable Avance XL Airfryer for almost 2 years and it still going good with some add-on accessories like grill pan, baking pan and double layer rack (with skewers) for different purpose of cooking. 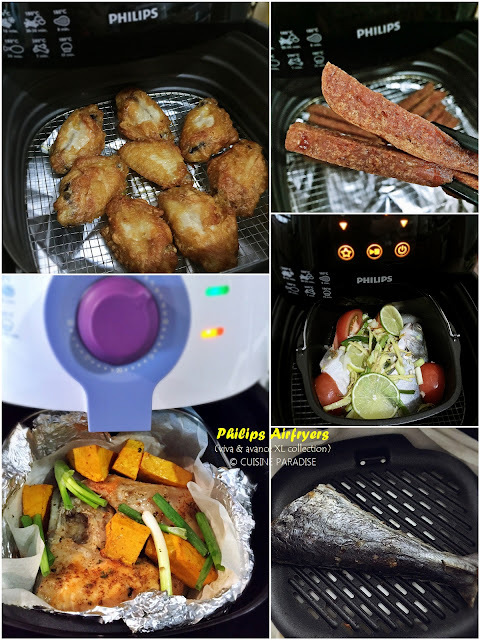 In this post it features two different types of airfryer (viva and avance) use to prepare some quick recipes on such as air-fried chicken and spam fries, steamed fish, baked pumpkin and etc which I hope it will be useful for your reference. Time flies when you are having fun and now we are into term 2 of school weeks where the boy needs to prepare himself the primary school leaving exam (PSLE) in another 6 months time. To me it seems just not long ago that I shared a post on 2015 March school holiday and here is another a new post for this year memories. Not much of adventures for this year school break because the boy still goes for his tuition classes as usual. 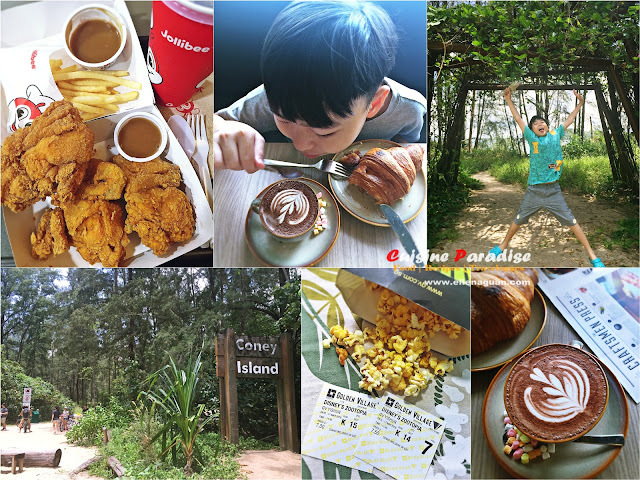 But despite of the rather "boring" schedule we managed to go for some food fun, catch up two movies and explore one of the new nature reserve near Punggol Park. Below is our journal for the week which I pen down as a memory to look back. Happy Egg-citing Easter everyone! I am sure most of you are having a great weekend filled with delicious food like roast lamb, hot cross buns, colourful Easter eggs and treasure hunt games. As for us although we did not prepared any Passover feast but I did made an Easter themed lunchbox for my kid to share with his classmate during lunch break. Hello folks, it had being almost two months since our last post till now and we hope you peeps are doing fine. Although I might not have time to update a proper post over here but time to time I still share our daily meals and bakes over at other social media such as SnapChat, Instagram or Dayre. Above was a quick quick dinner which I whipped up last weekend using two of the CP Food cooking kits which we received as media samples. We had Stir-fried Chicken with Holy Basil ($4.60) serve with steamed rice and sunny-side-up egg for two and Yakiudon prepared using Sliced Pork with Ginger Sauce ($5.90) together with sliced cabbage & onion. Recipes and snaps of preparation are available in this post too. Chinese New Year is approaching and I am sure everyone is getting ready for some steamboat (hot pot) sessions with family and friends soon. With that there are many ingredients which you can add in such as seafood, vegetables, meat and many more. Having steamboat is a great bonding time where everyone gets to sit around the table; chatting and enjoy the food while at the same time get your hands on cooking your favourite ingredients. Recently we received a new year bundle courtesy of Wong Kee Noodle which enable us to enjoy our favourite hotpot without much hassle. You can check their items from the list below for their new year special bundles. I still remember vividly when I was a child I always look forward to those reunion meals that we had with our grandparents, uncles and cousins. I love the atmosphere where everyone get together at the big table and enjoy those traditional home cook meals with special dishes only available during new year. As you know reunion dinner is an important affair especially for Asian families during Chinese New Year. But however people nowadays prefer to eat out in order to save the hassle of cooking and cleaning up. So I hope by sharing this post it will help to inspire you to prepare your very own reunion feast this coming new year for your beloved family.